omgawsh, where are the adults? all i run into (on imvu) are kids who whine about having no money then start begging. yip, yip, yip get a job! i did meet some nice ppl on twinity, but it was too pricey for me, and my avatar looked like a big fat tard. i couldn't figure out second life, and i'm a damned college graduate! lol. nuvera? BORING! does anyone have any cheese to accompany this whine? 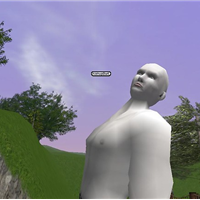 If you want to meet more mature people, Second Life should be your choice. Okay, navigation through SL is a bit more complicated, but as soon as you get the hang of it, you'll be grateful for all the possibilities. Now, SL isn't what it used to be: crowded with 100.000 people 24/7. Rates went back to 50.000 which makes a lot of sims rather empty. You really need to know what places to go to for some mature conversation and entertainment. Another setback in comparison to a few years ago is: English is no longer the lingua franca. For instance, a lot of Brazilians have joined SL lately, and not all of them master other languages than Portuguese. Still, creative use of Google Translate may be helpful. If you want to give SL another try, I may be able to help you through. I go under many names, but my official SL name is Pidt Resident. Look me up if you like.